Putting together the perfect landscape is rife with challenges,and one of them is figuring out how you want it to look at night. You have a lot of different options, but one thing is certain: you want it to look different in the dark than it does in the daytime. We’ve said it before and we’ll say it again: your landscape can look completely different at nightandthe perfect nighttime landscape lighting is an opportunity to show off your taste and design skills. Along with sod installation and sprinkler repair in Orlando we are very familiar with the different types of landscape lighting that you might want to employ. Today we are going to talk about the three most popular options that will change the look of your lawn depending on the time of the day and really bring out the best in it. 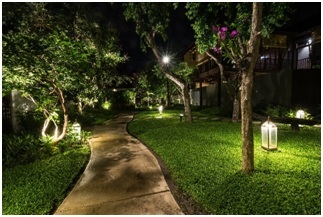 Well lights are a critical fixture in any landscape solution. These are exactly what they sound like: lights mounted in the ground and used for lighting very specific features such as trees, buildings, and plants are great examples. Additionally, well lights work overall to accent the landscape. 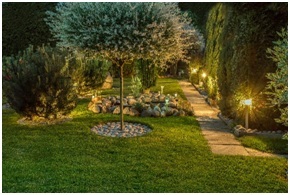 The best part about well lights is that while they are mounted into the ground, they manage to spread light evenly across buildings and plants, which make them a perfect option for uplighting. Bullet lighting, also known as directional lighting,is typically used to produce a more concentrated beam of light. They are smaller and normally powered by LED bulbs rather than the standard halogen. For this reason, they use less energy and burn longer, making them one of the more low-maintenance solutions in your landscaping arsenal. For the most part, these are used for focusedlighting and to draw an individual’s attention to specific points in the landscape. For example, if you have a particular landscape feature that you want to show off, like a statue or a fountain, bullet lights are a great way to do that. Floodlights are something that you will find in nearly any landscaping project; they are the most popular, and with good reason. To put it simply: flood lights illuminate or flood large areas with light, thus the name. A great example of a flood light in everyday life is a street light. Ideally, you would use these lights as a foundation for area illumination, in combination with accent lighting that pulls attention to specific landscape features. One of the biggest mistakes that people make when they are designing landscape lighting layouts on their own is using only flood lights to illuminate the entirety of the space rather than using a combination of flood and accent lighting. What you really want, is to create pools of light that draw attention from one point to the next. For example, you could have a set of shrubs or bushes that you would like visitors to see first, and then draw their attention to a fountain or statue. Bottom line: you want your guests to see everything but not be overwhelmed and by directing their eyes with lighting solutions you are making sure to keep their interest. You will be amazed at how much of a difference the right lighting makes. While all these tips are great, some of them can be very difficult to implement without professional help. Our seasoned professionals can give you exactly what you need, ensuring that you get not only great lighting solutions but also efficient results. Call us today for more information and make sure you check with us next week to learn more about how lighting can completely change your landscape at night.